No, that’s not a fraction. Well, it is. And so is 12/24, all halves. Intentional? Maybe! The program for the evening, poorly lit. Gunther Herbig was a student of the undeniably great Herbert von Karajan. German conductors. Mendelssohn, Schumann, Brahms. German composers. Lots of German. And it was wonderful. I didn’t attend the NSO’s concert last week (Schubert 6 and Bruckner 3), also under Herbig, but was delighted to see him for tonight’s program. It’d been a while, at least seven or eight months, and he was in top form: no stand, no score, dressed in all black, with his baton. It had also been ‘a while’ (as in almost three weeks, I think) since I’d been at our concert hall, so it felt good to be back. Saw some familiar faces and even chatted with a few. 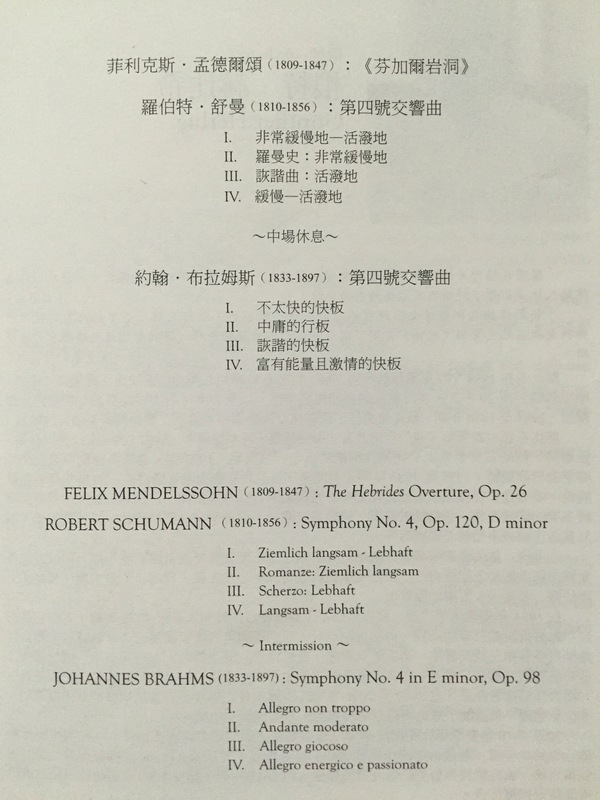 It also makes me extremely happy, after ‘programming’ my own blog posts and series and all the rest, to see a program like this, with the three most significant post-Beethoven German composers represented, even though Mendelssohn didn’t get a symphony in there (would have been a long concert). Not only that, they’re in chronological order, not only by composers’ ages but also date of composition. And then there’s that connection (or dozen) between Schumann and Brahms. The whole thing made for a very nice, neat package. We’ll actually be talking in the coming weeks about the first piece on tonight’s program, Mendelssohn’s Hebrides overture, a wonderful piece. I’ll save my reminiscences for when we speak about the work in detail, but I have strangely familiar, fond memories of it, and this is finally the first time I hear it live, and it was clean, crisp and passionate. The piece has always sounded to me like movie music, but with a serious musical nature, not just sappy drama. It’s got emotion and depth and lots to say compressed down into a sweeping, magical landscape that expresses all the wonder and mystery that I imagine Mendelssohn would have felt, and the NSO executed it truly flawlessly, I felt: brass, strings, woodwinds, balance, expression, drama and touch. It was delightful. Of the entire concert, I’d have to say the Schumann is not only the least familiar work, to me, but the least endearing, and yes, those could be related. As I stated, I have a strange little connection with Hebrides, and Brahms 4 is a masterwork, but as fourths go, I’d have rather heard Beethoven’s or Mendelssohn’s(recently heard fourths from Bruckner, Pettersson and Mahler), but of German symphonic composers, I guess Schumann would be the odd man out, so his is there. It has its great moments, to be sure, but it generally does not compel me. It has to be one of the most enjoyable, fascinating rehearsal videos I’ve ever watched (in any language) on YouTube, and I watched it six months ago even though I was hopelessly unfamiliar with the work. I was far more familiar afterward, and I’d actually forgotten about it until the piece began tonight. I can’t imagine Schumann would have written….. ‘blurrily’ but the clean, crisp, severity and Germanness present in Mendelssohn’s work seemed to have taken leave of the stage. That’s not (really) a criticism of the performance, but it felt less inspired, perhaps, just slightly the tiniest bit sluggish, I really can’t say. It really very much could just be me. The piece itself is an interesting one, and I will say that Herbig and the NSO made it coherent, a unified, full-on no-pausing end-to-end symphony. The real highlight of the evening, though, was the Brahms. I’ll have to find some place to talk about it soon, but I’ve recently had this epiphany with Bruckner, likely due in part to my recent transcendental experience hearing the Munich Philharmonic performing Bruckner 4. I heard the work live (played spectacularly well, of course) like I’d never heard Bruckner, and picking up my Skrowaczewski cycle, I listened to a few of them, and it was like… something had clicked. I got Bruckner. There was some sense of finality to it that I couldn’t put my finger on. Last concert of the year? Last concert for Herbig this season (I think)? Brahms’ (and Schumann’s, sort of) final symphonies? There was a certain energy, but also this strange bittersweet sadness of goodbye, perhaps because Herbig walked through the orchestra to shake hands with the performers, likely before he leaves us for some time. In any case, fantastic concert, very pleased to hear this program instead of more cantatas or another oratorio like in every American concert hall. Thank you again, as always, NSO, and thanks very much to Maestro Herbig. A pleasure. We’ll be back in just over a week for the NSO’s next New Year Concert (I’m going the day after, though). See you then.